I know some would ask why I bother to purchase unmarked plants. I live in a very small area, our selection is not much. I really love succulents and they seem to really love the upper floor of our home. Hi Lynn, it's hard to obtain succulents except by mail order from specialty nurseries that are named species, so you get what you can, right? So the first one, I'm leaning towards a Delosperma possibly - you can see more here: Delosperma or Ice Plant. The second one I'm really not familiar with at all. Sorry! Maybe once it blooms it will be more recognizable (I lightened it a bit - nice background, by the way!). The 1st pic looks like Crassula tetragonis to me. 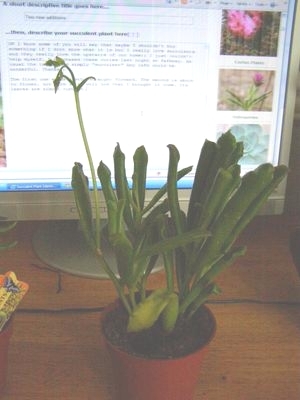 I have the same plant! I have the same plant as number one. I've been trying to identify it for years. It came in a variety pot I picked up at the grocery store 4 years ago, and has grown like crazy. 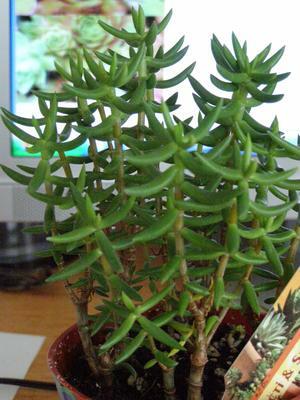 I'm not convinced of the Crassula tetragona ID because the leaves are kind of hairy/fuzzy. In all the photos of Crassula tetragona I've seen, the leaves are smooth. Thoughts anyone?